You’ll find it hard to come across a wellness retreat just as sophisticated and idyllic as this one. 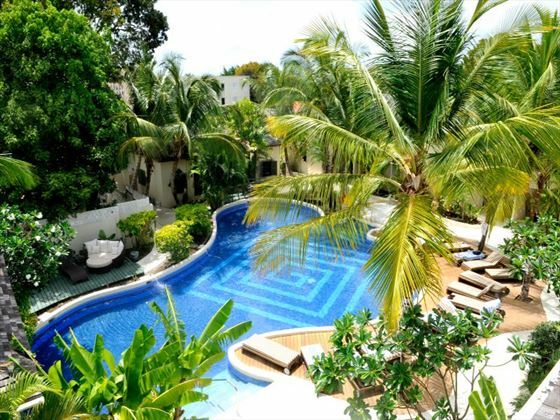 Taking pride in its eco-chic vibe and sensational spa treatments, this gorgeous all-inclusive oasis is the perfect escape should you wish to disconnect from your everyday stresses. 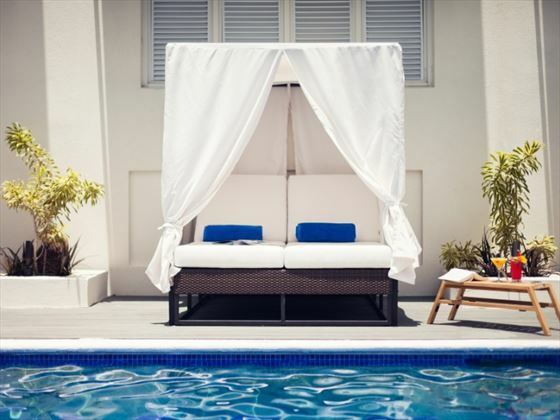 With up to four complimentary spa treatments included in your stay – dependent on your room category and length of stay – this is by far one of our favourite Barbados hotels for when we feel like truly pampering ourselves and unwinding. From revitalising facials and uplifting salt scrubs, to indulgent massages and detoxifying wraps, there’s an array of soothing therapies to choose from. We feel that delicious, comforting food is also key to feeling well and rejuvenated. This is certainly the hotel’s focus too, thanks to the two decadent restaurants serving up a feast of tasty Mediterranean cuisine and Asian fusion fare oozing with flavour. Kýma, the signature coffee bar and deli, is a sumptuous spot to tuck into food too, serving up light lunches alongside tempting coffees. 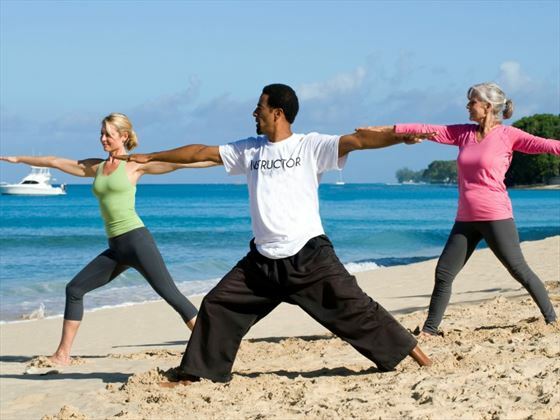 With an array of yoga classes, incredible oceanfront views, and the ease of an all-inclusive stay, we’re certain your mind, body and soul will relish a stay at this wellness paradise. 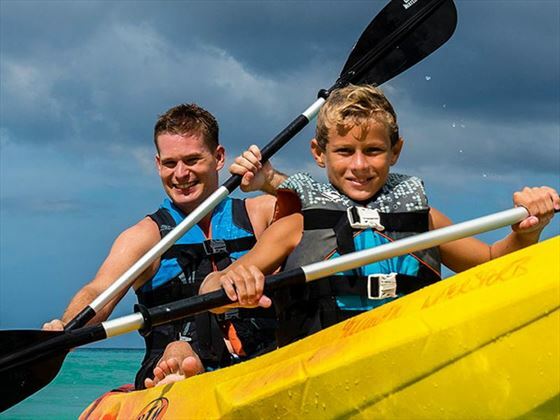 If you're bringing your family for a relaxing getaway together, you'll find a livelier family pool with ambassadors to keep you all hydrated and safe, as well as an array of complimentary watersports. 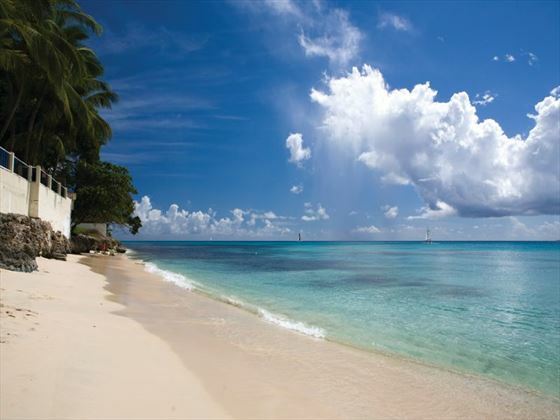 Sitting on the beautiful Platinum West Coast of Barbados by the charming white sands of Prospect Bay, this resort creates a perfect atmosphere of tranquillity. 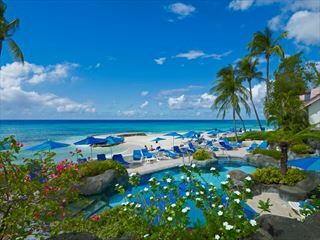 The resort holds a fantastic location, just a 12 minute car journey away from Bridgetown, Barbados’ Capital. Things to do in the city include duty-free shopping at cruise ship terminals, browsing through the upmarket boutiques on Broad Street and visiting the famous historical spots, from National Heroes Square to George Washington House. 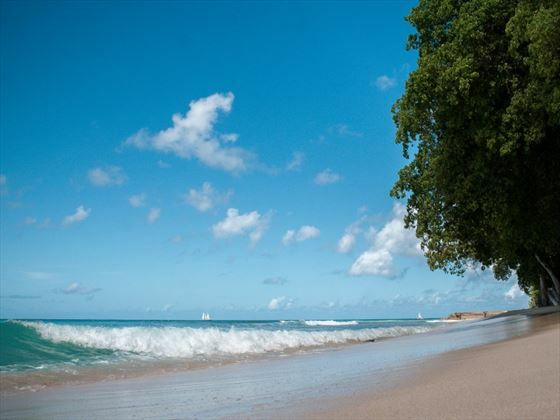 There are lots of beautiful beaches dotted along the coast to visit, including Batts Rock Beach, Paradise Beach and Brighton Beach. 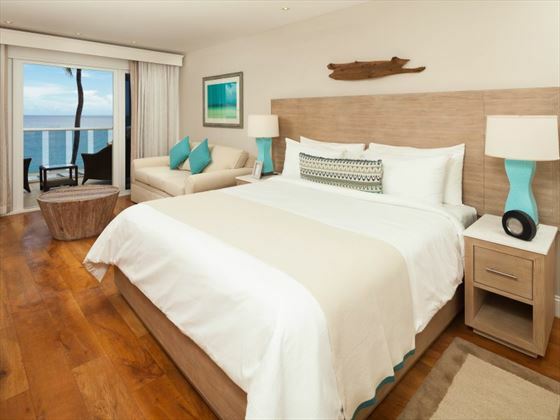 Standard Guest Room – Spacious rooms located on the 2nd and 3rd floors of the Oceanside building, with gorgeous inland views. Guests enjoy one complimentary spa treatment per adult per stay, and the room sleeps a maximum of three adults or two adults and two children. Duplex Suites – Stylish split-level penthouse suites. Featuring a guest bedroom with king-size bed and bathroom on the entry level, a spacious lounge with pullout sofa, fridge and wet bar on the upper level, and a beautiful top floor balcony. Guests enjoy one complimentary spa treatment per adult per stay, and the suites sleep a maximum of three adults or two adults and two children. 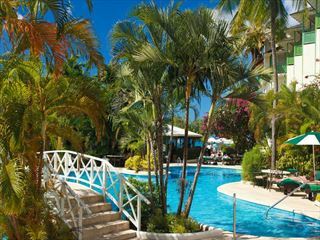 Pool View Spa – Located in the adult-only building of the property, with a large balcony or terrace overlooking the pool. Guests enjoy two complimentary spa treatments per adult per stay, and the room sleeps a maximum of two adults (16+ years). Pool View One Bedroom – Located in the adult-only building, offering a spacious separate bedroom and living space area, plus a balcony overlooking the adult-only pool. Guests enjoy two complimentary spa treatments per adult per stay, and the room sleeps a maximum of four adults (16+ years). 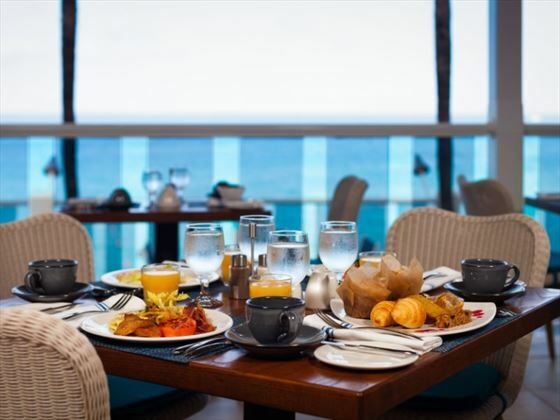 Oceanfront Room – Nestled on every floor of the Oceanside building, these feature lovely views of the ocean, as well as three complimentary spa treatments per adult per stay. Sleeps a maximum of two adults, or two adults and one child. 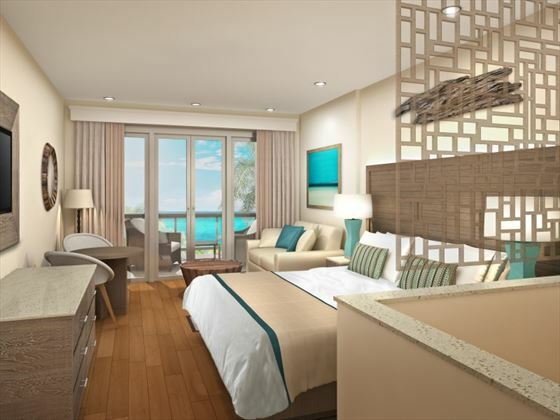 Oceanfront Junior Suite – Spacious suites featuring balconies with unforgettable views of the Caribbean Sea, plus a lounge area with a sofa bed and four complimentary spa treatments per adult per stay. Sleeps a maximum of three adults or two adults and two children. 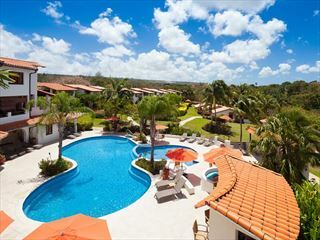 Oceanfront Duplex Suite – Sophisticated spilt-level penthouse suites. Featuring a guest bedroom with king-size bed and bathroom on the entry level, a spacious lounge with pullout sofa, fridge and wet bar on the upper level, and a top floor balcony with panoramic views of the sea. Guests enjoy four complimentary spa treatments per adult per stay, and the suite sleeps a maximum of three adults or two adults and two children. 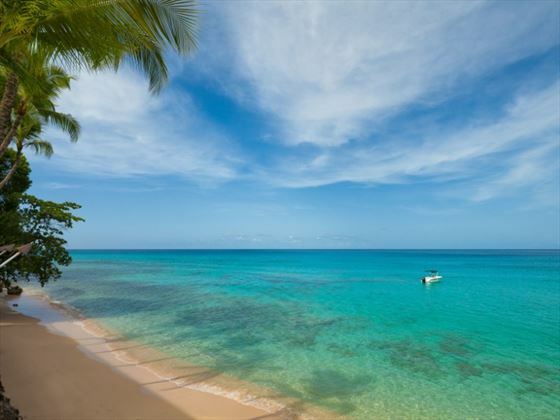 Complimentary motorised and non-motorised watersports including waterskiing , paddle boarding, tube rides, snorkelling, kayaking and sailing. Excludes jet skiing, which comes at an extra cost. Spa treatments in general require a minimum of 24 hours advance reservation. Guests must be 17 years or older to qualify for spa treatments. Honeymoon couples receive a bottle of sparkling wine and flower petals in room on day of arrival.